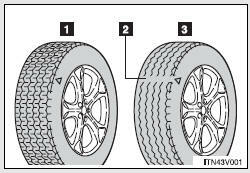 The location of treadwear indicators is shown by the “TWI” or “Δ” marks, etc., molded on the sidewall of each tire. Your Toyota is equipped with a tire pressure warning system that uses tire pressure warning valves and transmitters to detect low tire inflation pressure before serious problems arise. The compact spare tire is not equipped with a tire pressure warning valve and transmitter.